Democrats ask for an investigation on the one year anniversary of Congressman Gianforte’s assault of a reporter; we look at the latest campaign fundraising numbers; and a candidate’s past litigation may hurt his changes in the general election. 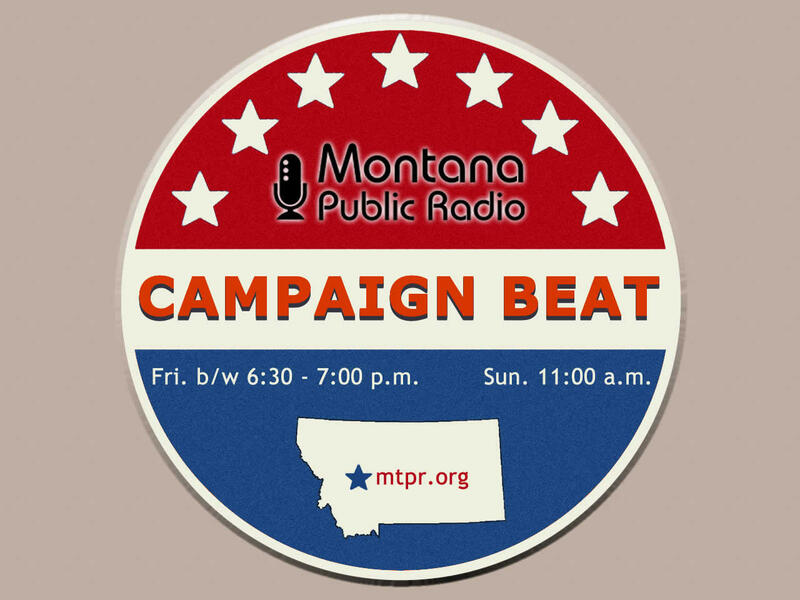 Those stories and more right now on "Campaign Beat." Eric Whitney: Howdy and welcome to "Campaign Beat" our weekly political analysis show. I'm Eric Whitney filling in for Sally Mauk. I'm joined by University of Montana Political Science Professor Rob Saldin and veteran Montana Statehouse Reporter Chuck Johnson. . Yesterday Mike Dennison reported a story about John Heenan and some legal work he'd done in the past. And Rob, you think this is pretty significant? . Rob Saldin: Yeah, the story by Dennison reported that John Heenan was the lawyer who filed a lawsuit on behalf of the Sierra Club and one other environmental group alleging that the out of state owners of the Colstrip power plants weren't in compliance with the Clean Air Act. .
EW: John Heenan is a Democratic contender for the U.S. House seat in Montana. .
RS: Right. And long story short, the case eventually was settled and a big part of that settlement was an agreement that two of the four Colstrip power plants would be shut down. This is the kind of thing I think that in the primary probably isn't going to matter, it might even help him. It does reinforce Heenan's presentation of himself as someone who will fight big corporations and he has a record to back that up, fighting for the little guy, this kind of thing. But the bigger concern here is that if he gets the nomination it could hurt in the general election. . Remember This is the same issue that Governor Bullock got just hammered on two years ago in his re-election campaign. His challenger at that time, Greg Gianforte who we'll bee seeing again in this House race in the fall accused him of not doing enough to help Colstrip, and the whole issue was just a tough one for Bullock. It put him in an uncomfortable position. And this time, this fall Gianforte wouldn't just have a governor who he claims should have been doing more to help support Colstrip, this time with Heenan, the Republicans will have the guy who filed the lawsuit that brought down half of Colstrip. That's how they'll play it. Heenan, of course, has his own side of the story here. But, just on the politics of it,you know, I think this is an issue that the Republicans would be thrilled to have. And I'd expect them to highlight the issue if Heenan is the guy who ends up being the Democratic nominee. .
EW: Sticking with the U.S. House race and Congressman Greg Gianforte who's defending that seat; Thursday was the one-year anniversary of this:. EW: And that's Gianforte body slamming Ben Jacobs, a reporter for The Guardian at a campaign event. Gianforte later pleaded guilty to a misdemeanor assault for that. And on Thursday, Montana's Democratic Party asked for a congressional ethics investigation into Gianforte for lying to media and law enforcement, because at the time of the assault he and his spokesman said that the reporter initiated the attack. Is this a realistic complaint, or are they just trying to make political hay here? RS: I think mostly political hay. It's a good way of reminding people what happened. They seem to be making more of an issue about Gianforte's lying and his lying to constituents. It's almost less about the assault itself, it's more about the lie. That's a little bit interesting. They seem to think that that's where the real traction is. There is one piece of that that that I continue to think just hasn't quite gotten the attention it deserves. You know, initially as you said Eric you know they blamed Jacobs for this event and had it not been for all of the eyewitnesses who were in the room and could refute it. You know that's the kind of thing that really could have brought down this guy's career. And so that's no small thing and to be clear, Gianforte has apologized repeatedly, but I haven't seen any real grappling with that issue. You know he's apologized for the assault but never really taken full ownership of going after saying it was somebody else's fault, somebody else instigated this when clearly that wasn't the case. "We need to talk about regulating military style rifles. And if the gun lobby wants to give me an "F" for talking about common sense, I proudly say that stands for fearless." EW: Kathleen Williams got applause for making those remarks at the event. But, I don't get the sense that one more school shooting is enough to change gun politics in Montana. And I think that the candidate talking about more gun regulation here really is only hurting their chances to get elected. What do you guys think? . Chuck Johnson: I don't think it hurts her at all in a Democratic primary. It could hurt her in the general election if she's the nominee. But polling consistently over the years has showed Montanans oppose gun control, and at what point do these shootings add up enough so where people are willing to take a look at some stricter gun control? I don't know. RS: I Think Chuck's exactly right. Great issue for a Democratic primary. Bad issue for the general. You know, looking at this campaign I do think the gun issue is really what has come to define Williams' campaign. What has helped her have as strong of a showing as she had. You know going into this it seemed like Heenan and Keir were the clear front-runners. She definitely seemed to be the one who could maybe make that leap. And she's used the gun issue to do that. I think she's run a lot stronger than a lot of people thought. You know, the one thing that does still stick in my mind though is early in the campaign at the candidate forum in Missoula, she, along with all of the other candidates, basically spouted off NRA talking points. And so she's changed her mind or started emphasizing different things. And candidates should be allowed to do that, but her message on guns now is quite different than it was at the beginning of the campaign. But to her credit I think she saw an opening there and nobody else was going to take it. And it's certainly something that can help her in the primary. EW: Sticking with the Williams campaign; Chuck you've had a look at the latest campaign finance filings with the Federal Elections Commission and it sounds like one take-away from the latest filings is that Kathleen Williams isn't really keeping up in the fundraising department with some of the other Democratic candidates. .
CJ: That's correct Eric. She started out pretty far behind, although interestingly she raised quite a bit this last period. She raised $68,000. She actually outraised John Heenan for the six month period that ended in the middle of May. But overall, she doesn't have the kind of money that either he or Kier does. EW: In terms of overall fundraising, Williams is still about half a million dollars behind Grant Kier and even further behind John Heenan. CJ: That's correct. She's got about $90,000 in the bank as of the middle of May. Kier has about $168,000 and Heenan has $92,000. But what Heenan has done is write himself checks. So far in the campaign he's written at least $350,000 worth of checks to himself as loans, or about 36 percent of the $968,000 he's raised altogether. But she's picked up her fundraising the last but still trails them pretty badly. Kier for the six weeks raised about a $105,000. And he's only put in, I think, $2,700 of his own money throughout the campaign. So if you look just at the money you'd say it's a two-person race. Williams though, I think, has a little momentum with the gun issue but her fundraising isn't getting a huge advantage from that, although she did do well this last period. .
EW: And In the last period it looks like John Heenan wrote himself a check for a $100,000 or loaned his campaign a $100,000 just in the latest reporting period. Any other significant takeaways from your glance at the latest campaign finance reports from the House candidates? CJ: Greg Gianforte has $1.1 million sitting in the bank. He doesn't have to spend much in the primary but as soon as the Democrats pick their nominee Gianforte has $1.1 Million to spend against that person and to promote himself..
EW: The Senate candidates have the same filing deadlines as the House candidates, but the House candidates are required to file electronically. So we have really good numbers on them after the Thursday filing deadline but we haven't heard from the the Senate candidates yet, right? CJ: That's correct. The Senate has these old fashioned rules where they at least enter a lot of them by hand still wheras the House sends them electronically and they're posted right away which is really advantageous for voters and journalists and everyone else. .
EW: What are you going to be looking for when this Senate campaign finance and spending numbers come in? CJ: In my opinion it's a two-way race between Matt Rosendale and Russ Fagg for the Republican Senate nomination, and those will be the key numbers to watch, those two I think. .
EW: I guess speaking of the incumbents in the House and Senate races, Greg Gianforte and Senator Jon Tester they're campaigning at least in part on their legislative track records. And this week we saw the farm bill that Congressman Greg Gianforte has been backing vociferously; that died in the House. And on the Senate side, two or three big bills Senator Jon Tester fought for passed and are now headed to President Trump. Chuck do you think those are going to have much impact on voters in the Gianforte and Tester? CJ: The Tester bills will definitely give him a boost because he can say he can get bills passed even though he's in the minority. He worked on the Senate version of the banking bill which passed and has been signed into law by President Trump. So Trump can't really say that you know Tester can't get anything done. And Tester also has worked on a veterans health care bill that's headed for the president. And I think what Jon Tester can do is point to all these bills that he's gotten through where he's either sponsored or played a major role as a co-sponsor. That will help his campaign narrative a lot. EW: On That banking bill though, a lot of Democrats didn't want to see the rollback of the Dodd-Frank financial regulations that this bill that Tester worked so hard on to get passed. You think he faces any issues there with passing a bill that Democrats really don't like? CJ: Senator Elizabeth Warren of Massachusetts criticized the bill pretty harshly earlier on this spring and actually put out a release mentioning the Democrats such as Tester who supported them by name and was kind of chewed out for doing that. I would say the Bernie Sanders type, the left of the Democratic Party, they think it's a giveaway to the big banks. Tester and people that support it argue that it's really there to help small community banks like those in Montana, and it does ease some of the restrictions of Dodd-Frank for the larger banks too. We shall see. I mean, you know, we've had a big savings and loan scandal in the 80s and early 90s we've had the housing and bank scandal in the late 2000s that you know really came close to toppling our economy. So we'll see how it works out. I don't think it will hurt him so much in the general. If he had a primary opponent, someone who would probably make hay over it, but I don't think they'd have much success. But certainly I would imagine the Republican candidates for the Senate would would support something like that, so I think it's probably a non-issue in the general election. .
EW: What about the farm bill getting torpedoed in the House? I know Congressman Gianforte has been talking a lot about using it as a vehicle to get some policies changing the way forests and public lands are managed across. You think he suffers much by the failure of the farm bill? CJ: The farm bill will probably come up again. It had a lot of opposition for a couple reasons. The conservative faction of the House opposed it because the House hasn't dealt with the president's immigration proposals. It also was controversial because it would have imposed work requirements on people that are getting SNAP or food stamps. If they're capable of working it would require them to work. This was controversial with a lot of Democrats, but there'll be another crack at this bill at some point. EW: One more thing I wanted to take note of this week was on Tuesday, the 9th U.S. Circuit Court of Appeals upheld Montana's Disclose Act. That's the dark-money law that was passed in 2015 that says that any person or organization attempting to influence voters within 60 days of an election in Montana, that they have to identify themselves. Rob is that really a big deal? RS: I think it's a big deal in the sense that it's a real victory for the supporters of the new law. The U.S. Circuit appeals courts are just one level below the U.S. Supreme Court. How they do this is they randomly select three judges. And so sometimes it's the case that these three judge panel don't necessarily reflect the thinking of the full bench. And so the group challenging the Disclosee Act, you know, this isn't necessarily the end of the road for them and their challenge. They certainly will appeal and they can do that either by asking the full 9th Circuit to rehear the case, or by going straight to the U.S. Supreme Court. But you know, as I see it there's no guarantee that either would agree to take it. The 9th Circuit is known as the most liberal of the appeals courts, and I'd be somewhat surprised if they felt compelled to revisit the case. By contrast, the Supreme Court, which of course brought us Citizens United, might be more receptive to taking a challenge, although even that, I think, is far from certain. They just don't take very many cases, period. And if neither of those routes of appealing this thing work out, then it's this week's ruling that's going to be the one that will stand. EW: Chuck, Rob, thanks for joining us again on "Campaign Beat." I think we're all looking forward to Sally Mauk coming back next week and the primary election in a couple of weeks.